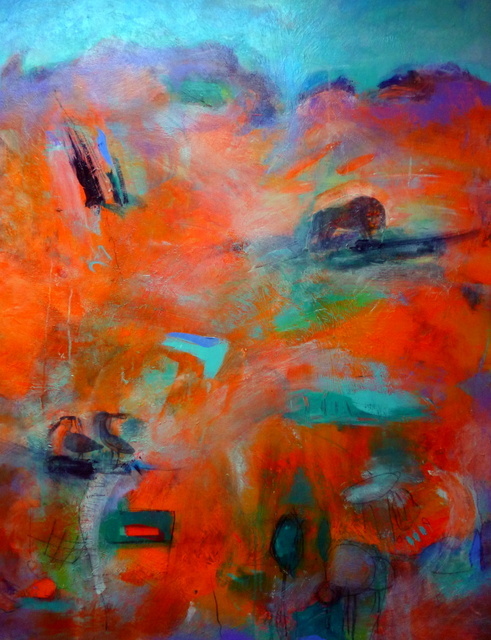 My abstract narrative paintings are rich in modern color, gestural expression, and hidden motifs. Sometimes I paint to interpret a pre-existing myth, story, or idea, and sometimes the painting itself produces its own intuitively evolving territory of icons, symbols, and beings, as in a dream. The paintings in the Terra Incognita series reference the notion of unexplored territories and re-interpreted mythology and anthropology including Lascaux and other caves, Greek myth, and the psychological underworld. 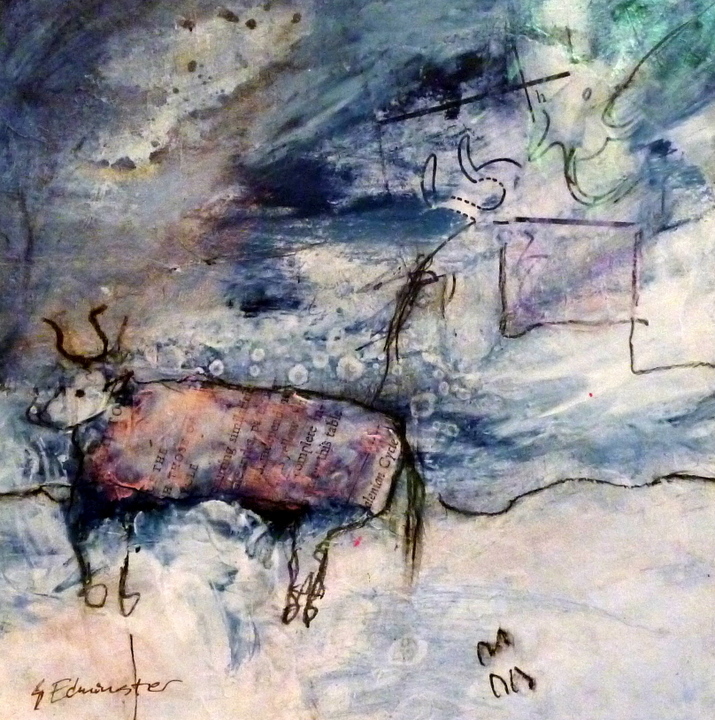 Abstracted animal forms often carry messages; animals as storytellers date back to Paleolithic times. I am part Native American and sometimes incorporate petroglyphs and ancient signs. My art developed out of my training in poetry and from my life in Europe, where I began painting, and South India, where my love of bright, often clashing colors was born. I explore archaic worlds to forge ancient metaphors into contemporary vision. My mixed media pieces are “contemporary primitives.” I see the canvas or paper as a permeable membrane through which line and image appears and vanishes, like the cave shelters and walls where man first inscribed both realistic and abstract images. The images appear in tandem with random design elements in the subsurface; a crack in the rock, or in the gesso, becomes part of the figure, as in the ancient wall paintings. The emotional affect ranges from joyous to melancholy: the series “Lascaux” with its chilly monochromes contrasts with the childlike, happy heiroglyphs of the “Tabula Rasa”series. The work is primal and pre-verbal: text is used, but less for language or meaning than design. In contrast to my paintings, my mixed media pieces are often white, neutral, or monocromatic, with bits of color floating in a more neutral world. These pieces are dreamy and powerful omens that each person may read differently. I work on certain pieces for years, sanding back to other surfaces in an archeological journey of expression and emotion. I have just stumbled upon your site courtesy of WordPress reader – what a great find for me. I feel mesmerised by what I’m seeing – many congratulations on your work.